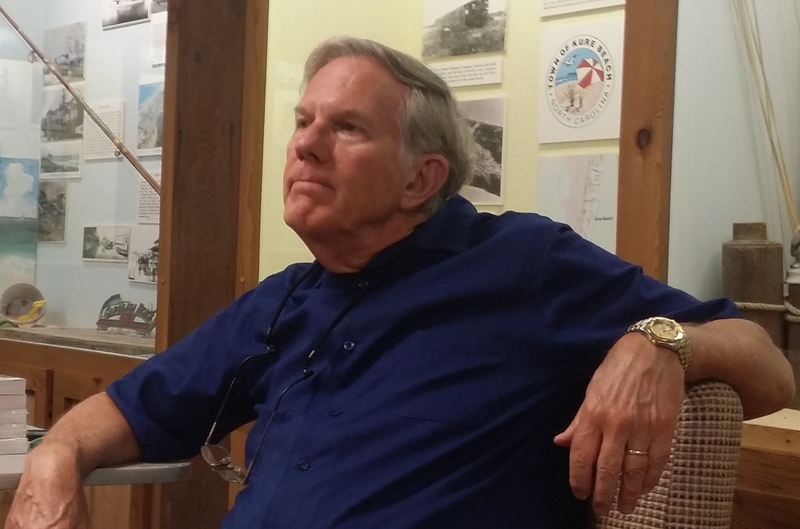 John Batchelor, food critic and author of Chefs of the Coast, Restaurants and Recipes from the North Carolina Coast was the featured speaker at the May 2017 History Center meeting. He spoke on his experiences as a restaurant reviewer for newspapers in both Winston-Salem and Greensboro and as a judge of restaurant cooking competitions throughout Western North Carolina. These experiences led him to write first , Chefs of the Mountains with recipes and stories from some of the restaurants he’d visited there. To some people (like me), John’s would be a dream job: sampling delicious food, hearing the chefs’ and restaurateurs’ stories of how they got into the business, learning at least some of their secrets and recipes, finding out where their ingredients come from, and compiling these experiences into a beautifully photographed collection to be shared with others. Apparently John thought so too, and he began work on Chefs of the Coast. One of the things he learned in his first book was that refining recipes that are meant to serve fifty down to recipes that serve four is not so easy. 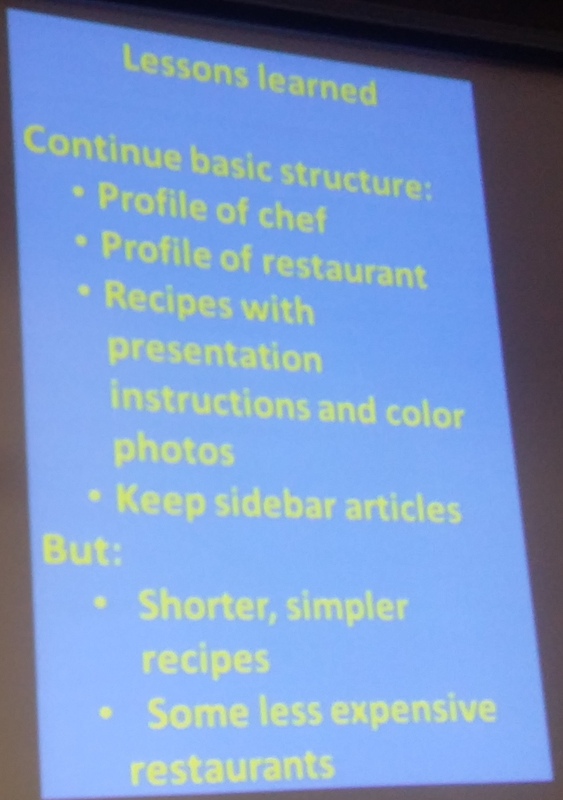 Based on feedback he’d gotten on his earlier book, he also knew readers wanted simpler recipes and that some relatively inexpensive restaurants needed to be included. 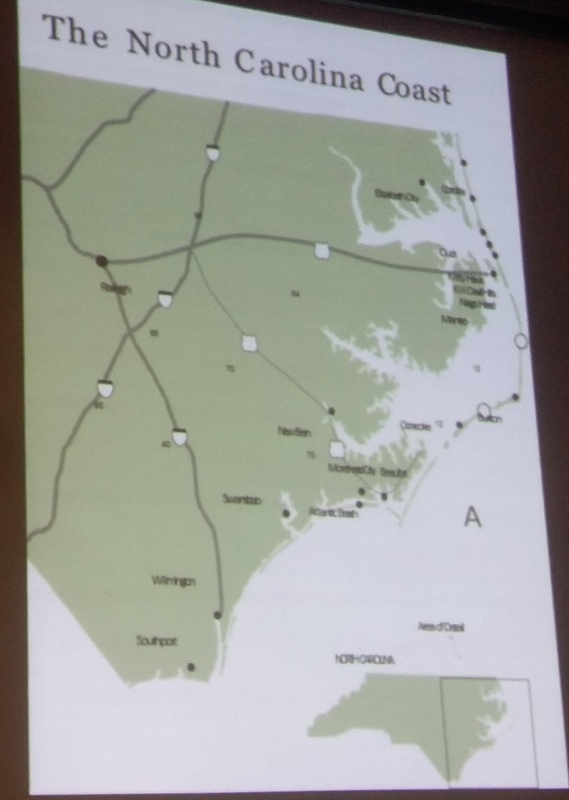 Seventeen Wilmington and Southport restaurants are represented in the book, which leans heavily toward the Outer Banks. He said the key to pulling everything together came from his interviews, where a line or two would stand out and inform the focus of the entire segment. For example, “If it’s white – rice, flour, sugar – don’t eat it,” is John’s own food mantra. He acknowledged that many home cooks can prepare a meal that’s every bit as tasty as what a top chef prepares, but for two or four people rather than a restaurant full of people all wanting different meals. John’s line that stood out for me was this: The traditional chef’s hat has one hundred folds in it, signifying that a good chef should be able to cook an egg one hundred different ways, from memory.